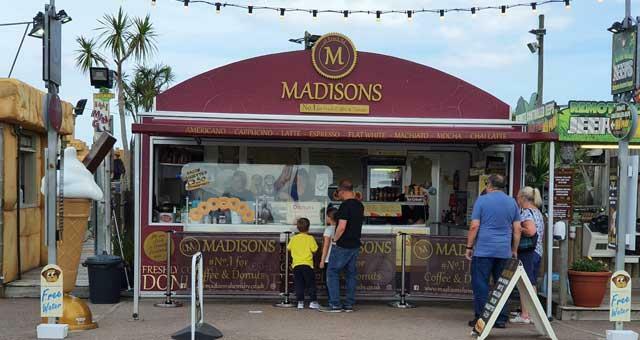 Madison's07818646638work TakeawayMadisons in Hemsby near Great Yarmouth - #1 for coffee donuts & waffles. We serve the freshest donuts, waffles & pancakes on a stick, All cooked to order with a large choice of toppings. Melted Belgian chocolate being a firm favourite. We also serve freshly ground coffee, speciality teas, cold drinks, Nachos, Angelitos whippy ice cream & 12 flavours of Parravanis scooped ice cream. We are food allergen compliant & have been awarded a food hygiene rating of 5. 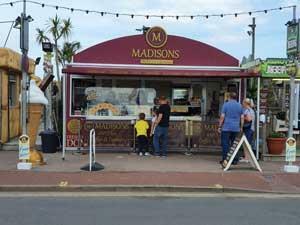 Madisons in Hemsby near Great Yarmouth - #1 for coffee donuts & waffles. We are open from Easter till the end of October. Opening times vary, please call for info.